his conference was part of a joint programme between the universities of Leiden, Cambridge and Oxford on the history of Persian literature and culture. The programme was discussed and developed at the inaugural meeting of the European League of Non-Western Studies (ELNWS), which was established in Leiden in July 2006. 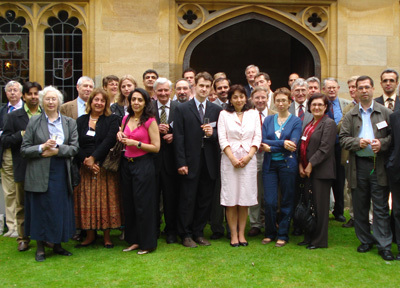 The first conference of this programme ‘Traditions in Persian Linguistics and Literature’, scheduled for five years (2007-2011) was successfully organised jointly by the Leiden and Oxford Universities starting July 2007. The main aim of the two day conference was to investigate the phenomenon of the “sudden” revival of Persian culture in the 9-10th centuries after a chronological gap of two centuries. This period in the scholarly literature dedicated to Iranian studies is usually called “two centuries of silence” due to the lack of almost any evidence of written monuments between the Arab invasion in Sasanian Iran in the seventh-century A.D. and the earliest surviving literary examples in the New Persian language of the period of the Samanid dynasty (819-999), with their capital in Bukhara. Historically, Central Asian Transoxania, being for many centuries before Islam a melting pot of many cultures from Buddhism to Hellenism, by the ninth- to tenth-centuries found itself on the periphery of the Arab Caliphate, more independent from the Islamic centre and more productive in creating their own state, based on the pre-Arab traditions, than any other parts of the Islamised Iran. 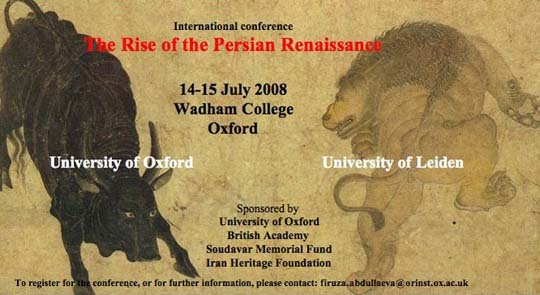 This was the first attempt of scholars whose interests have been divided by this chronological and cultural border of two silent centuries into two separated worlds of Iranian studies – Ancient and pre-Modern: pre-Islamic and Islamic ones – to combine their knowledge in explanation of the Persian Renaissance phenomenon from both sides of this border. The main idea of all the papers, is to show the continuity of the Iranian cultural tradition through several transitional periods of their history, and reshaping of the existed religious and cultural milieu of the societies, rather than violent replacement of one religion by another. Convened by Firuza Abdullaeva (University of Oxford) and Asghar Seyed-Gohrab (University of Leiden).